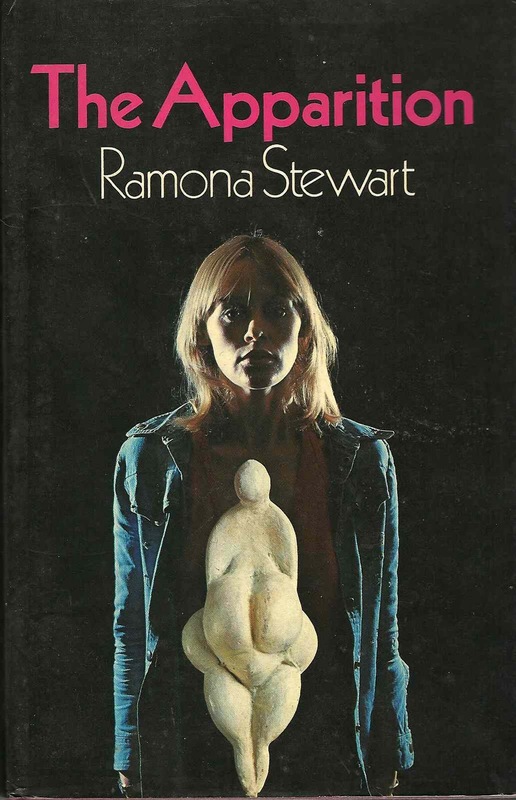 Inner cover blurb: 'Ramona Stewart's new novel The Apparition is a compulsively readable story which draws on the supernatural and yet remains firmly grounded in a recognisable human landscape. Paul Timberley is an archeologist, 'a seasoned traveller in the land of the dead' who is beginning to be bored by successful academic life. He has a civilized relationship with a sensible mistress, is devoted to his rheumatic old dog, and is somewhat worried about his son Chris. Chris is an underground movie-maker who works surrounded by a court of revolutionary runaways who depend on drugs for their drive and frenzy. He is filming in a vast, crumbling New York mansion, turned into a place of fantasy by his bizarre entourage. Any ghostly presence appearing there must surely be produced by hallucinogens, and nothing to do with the rather square professor who has come to see his son and drifts diffidently about on the fringes of the exotic goings-on. The disturbing thing is that presence - for one does appear - manifest itself far more powerfully to the father than it does to the son. It - or she - is a tantalizing waif who fills Paul with an intense longing and appears to be connected with the magical cult objects of his trade. As he struggles to understand what is happening, we learn more about Paul's past: his miserable childhood, his wife's madness and suicide, the unexplained murder of his brother-in-law. It begins to appear that the man, and his relationship with his son, are considerably less simple than they seemed at first sight. Choosing his own way of driving a shaft into his subconscious - or into the past? or into some mysterious region outside the 'real'? - Paul undertakes an experiment as dangerous as any Chris might favour; and he does in fact discover the truth... but only at the moment of his death. Quick flick reveals: The novel is even more pretentiously written than the above summary.